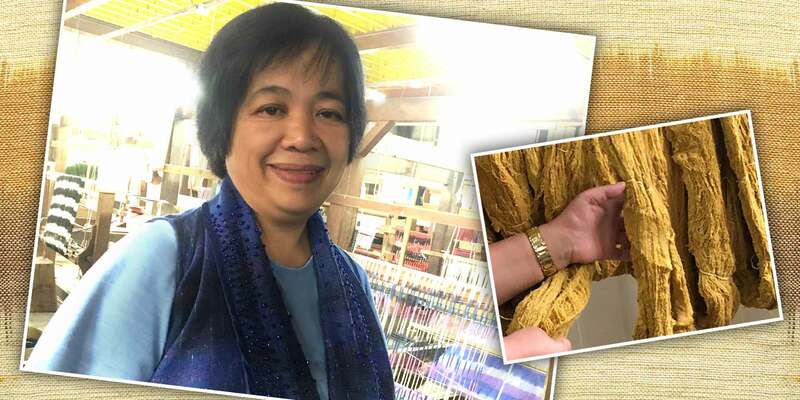 Virginia is another one of our expert traditional Cordilleran hand weaver. She’s from Sabangan, Mountain Province. 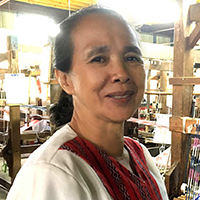 She’s been weaving at Quirino Hill, Baguio City, where she, her husband and 6 children resettled, when Narda’s asked her to join. Narda’s was lucky that she relented. She said she enjoys working at Narda’s because her co-workers are nice. And our founder, Narda Capuyan, was even nicer. Besides, she said, weaving is all she’s good at. And that’s good for Narda’s and even better for the Cordilleran hand weaving tradition. She shares with us her knowledge and expertise. But as most modest Cordilleran craftswomen, she’s not conscious of her part in preserving the Cordilleran hand weaving tradition. It’s just something that has to be done, not mindful of her remarkable cultural contribution. And more importantly, she teaches her skills to the next generation of weavers who will keep the tradition alive. Don’t be deceived by her stern bearing, she’s as nice as the rest. Pacita is Narda’s Finisher. Not a shred of stray yarn get past her. She’s been with Narda’s since 1994. She’s from San Gabriel, La Union but married and settled to the Cordilleras. Though not originally from Cordi, she imbibed the culture and traditions thoroughly. She’s a mother of 6, one still in high school. Before joining Narda’s, she used to tend the vegetable farms. But her cousin and aunt advised her to apply with us. Lucky for Narda’s! She likes working at Narda’s for her nice collegues. She gets sentimental recollecting our founder’s, Narda Capuyan, teachings. She was nice and patient with all of us, she said. 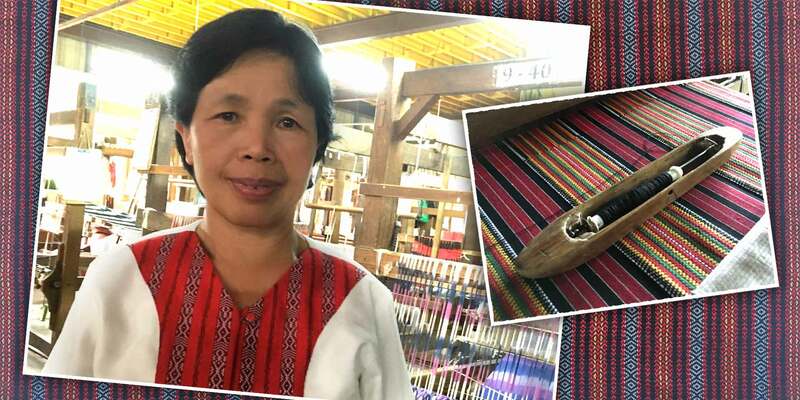 As unassuming as most Cordilleran craftswomen, she’s not conscious of her part in preserving the Cordilleran hand weaving tradition. It’s just something that has to be done, not mindful of her remarkable cultural contribution. It’s not just weaving after all that preserves the tradition but the whole production line of creating products that makes it sustainable. And more importantly, she teaches her skills to the next generation that will keep the tradition alive. 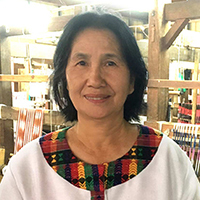 Helen is from Besao, Mountain Province and she’s been weaving with Narda’s since 1994. 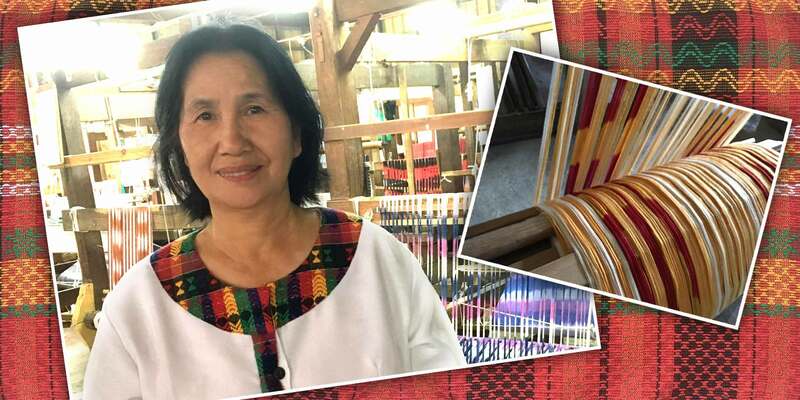 Before she joined Narda’s, she’s been weaving in Sagada. 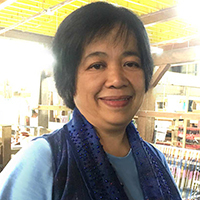 She’s an expert in traditional Cordilleran hand weaving. This Cordi mother-weaver has 3 children. She joined Narda’s in order for her to send her kids to school, one is a librarian and another is a vocational graduate. She likes working with Narda’s for the benefits and the many things she learns aside from improving her weaving techniques. Asked what she think she contributed to Narda’s, it’s the quality of traditional hand weaving, she said. And teaching the new weavers the ways of traditional hand weaving, which for Narda’s, maybe as important if not more important. 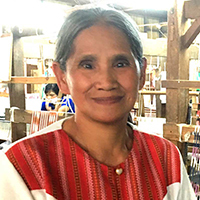 But as most humble Cordi craftswomen, she’s not conscious of her part in preserving the Cordilleran hand weaving tradition. It’s just something that has to be done, not mindful of her immense cultural contribution. 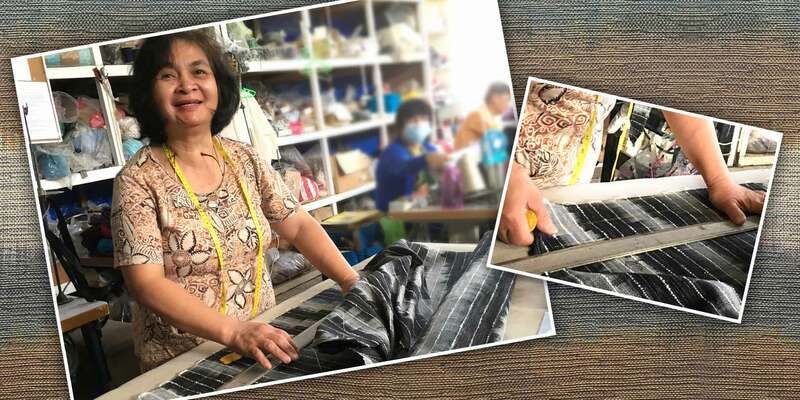 Narda’s Dyeing Director, Florence Bauing, have been with Narda’s for 32 years. She’s from Besao, Mountain Province but spent her teenage years in Baler, Aurora helping out her aunt in her grocery store and cooking meals for the kitchenette. She moved to La Trinidad, Benguet when her grandmother got tired of her just doing “mantaw”, hanging out with friends, and applied her to Narda’s. She started in the dyeing department without prior experience but enjoyed it ever since. She enjoyed dyeing that much it never occurred to her to learn weaving. She was trained well by Narda’s but her most nerve wracking experience was her first time to do the process by herself. Her greatest fear is not to get the right color correctly despite the inherent difficulty of the traditional process. She has no problem handling natural dyes except for indigo. Among the commercial dyes, she finds handling taupe challenging. She’s been constantly tested with tying problems. But these challenges make her enjoy her work more. And she never given up her passion for cooking so she bakes and make jams from our farms produce. She may not be aware of her contribution in preserving our Cordilleran hand weaving tradition, but it’s surely is remarkable. Through her years with Narda’s, for her, it’s just something that has to be done, basking not in her extraordinary cultural contribution. But maybe her more meaningful contribution is teaching the tradition to the next generation. She has a 29 year-old nurse and a 26 year-old chef. Both are fine young men she and her husband brought up very well. Felipa is one of Narda’s senior sewers. She’s been with Narda’s since 1997. She’s from Tinoc, Ifugao but settled with her husband in La Trinidad, Benguet. Her story joining Narda’s is a peculiar one. Her sister-in-law who was with Narda’s then resigned to go abroad. But her supervisor then asked her to please not leave until here’s a replacement. So she recruited Felipa who was a housewife then. Without any background in sewing, aside from tinkering with her sister-in-law’s sewing machine from time to time, she agreed for her first work. Lucky for Narda’s! She’s dedicated, diligent and quick to learn. Another Cordilleran mother natural. Once she sat at the industrial sewing machine, she just knew instinctively what to do. She quickly learned the more intricate sewing techniques. Three years after joining Narda’s, her husband died of heart attack. Her youngest of 4 children was just in Grade 1 then. She gets sentimental recollecting that without Narda’s, she couldn’t have raised her children and send them to school. She’s grateful for Narda’s support as well for the nice camaraderie of her fellow staff, most have been with Narda’s as long as she did, some even much longer. 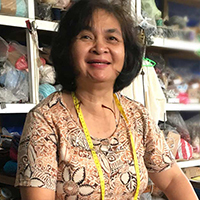 She learned at Narda’s the value of perseverance, dedication and quality of work, which she imparted to her children growing up. 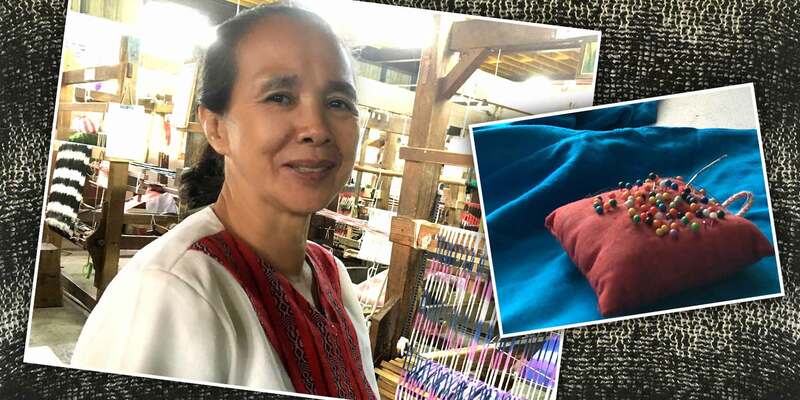 As modest as most Cordilleran craftswomen, she’s not conscious of her part in preserving the Cordilleran hand weaving tradition. It’s just something that has to be done, not mindful of her remarkable cultural contribution. It’s not just weaving after all that preserves the tradition but the whole production line of creating products that makes it sustainable. And more importantly, she teaches her skills to the next generation that will keep the tradition alive. Marcelina have been with Narda’s since 1996. She’s from Tadian, Mountain Province. She’s a widower with 5 children. 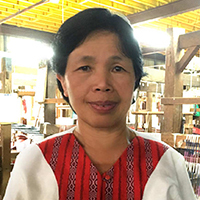 She’s one of our expert traditional Cordilleran hand weavers. 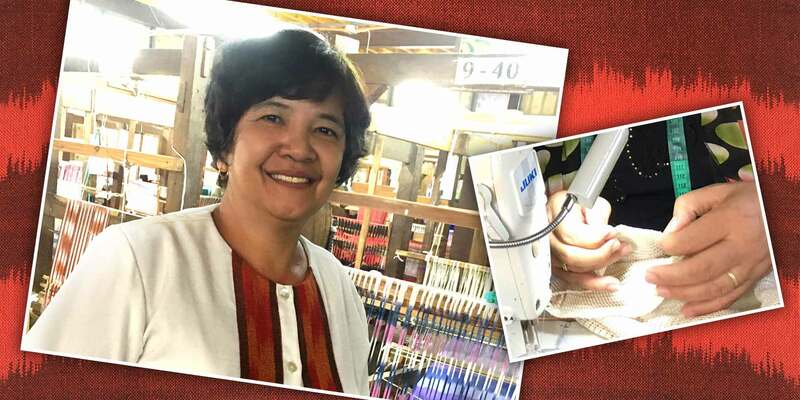 She used to back strap weave blankets in her province before she joined Narda’s and resettled in Baguio. She loves weaving with Narda’s. 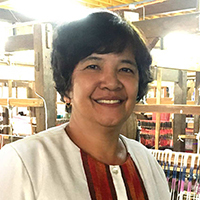 At Narda’s, she learned to weave other than blankets like shawl, scarf and placemat. She gives importance to quality of weave and durability. She’s grateful that trough Narda’s, she got to improve her house and sent her kids to school. Sabeth, as she’s fondly called, has been with Narda’s since 1982. Elizabeth Butardo is Narda’s quality controller / non-garment pattern maker and prototype maker. She’s from Besao, Mountain Province, married in Aringay, La Union and settled in La Trinidad, Benguet as a housewife. One day in 1982 after her errand in the market, she passed by Narda’s factory, which was at KM5 then, and saw the sign “Wanted Help”. Wanting to help out on family income with two kids then, she applied. She started doing the rounds, cutting fabrics for bags. She learned what she does today by merely watching what her supervisor did then. She started exploring more, learning how to pattern bags and constructing prototypes. Probably more than skills, she learned at Narda’s the importance of hard work and the quality that’s put into it. She imparted these values to her 3 boys. The eldest is now a pharmacist, the second works at a glass manufacturer but graduated as a seaman, and the youngest a civil engineer. 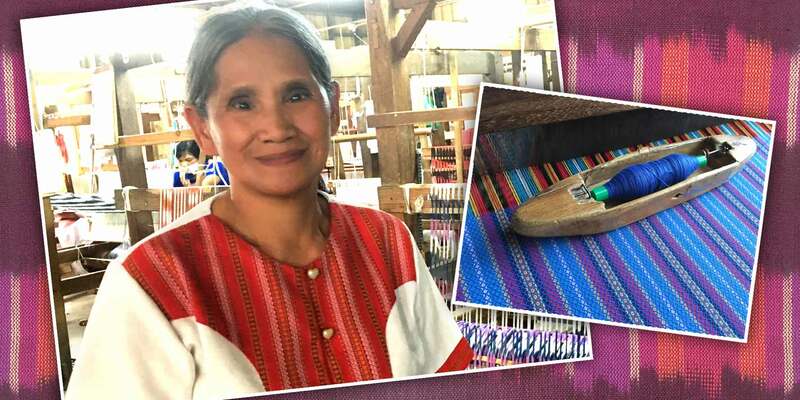 As most Cordilleran craftswomen, she’s not conscious of her part in preserving the Cordilleran hand weaving tradition. It’s just something that has to be done, not mindful of her remarkable cultural contribution. It’s not just weaving after all that preserves the tradition but the whole production line of creating products that makes it sustainable. And more importantly, she teaches her skills to the next generation that will keep the tradition alive.